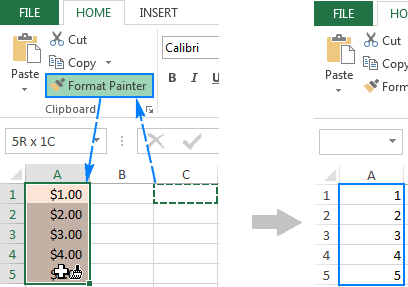 This short tutorial shows a couple of quick ways to clear formatting in Excel, and explains how to remove only specific formats in selected cells. When working with large Excel worksheets, it's a common practice to apply different formatting options to make data relevant to a particular situation stand out. In other situations, however, you may want to highlight other data, and for this, you will need to remove the current format first. Manually changing cell color, font, borders, alignment and other formats would be tiresome and time-consuming. Luckily, Microsoft Excel provides a couple of quick and simple ways to clear formatting in a worksheet. Moreover, there is a way to remove only specific formatting, and I you will learn all these techniques in a moment. The most obvious way to make a piece of information more noticeable is to change the way it looks. Excessive or improper formatting, however, may have an opposite effect, which makes your Excel worksheet difficult to read. The easiest way to fix this is to remove all current formatting and start embellishing the worksheet from scratch. Select the cell or range of cells from which you want to clear formatting. On the Home tab, in the Editing group, click the arrow next to the Clear button button. Select the Clear Formats option. 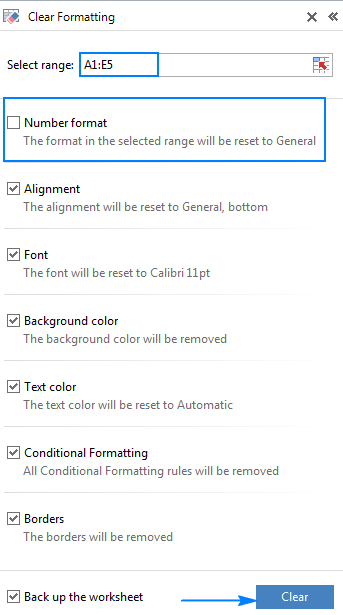 This will erase all cell formatting (including conditional formatting, number formats, fonts, colors, borders, etc.) but keep the cell contents. With this Excel Clear Formatting feature, you can easily remove formats not only from a single cell, but also from an entire row, column or worksheet. To clear out formatting from all cells on a worksheet, select the entire sheet by pressing Ctrl+A or by clicking the Select All button at the top-left corner of the worksheet, and then click Clear Formats. To remove formatting from a whole column or row, click the column or row heading to select it. To clear formats in non-adjacent cells or ranges, select the first cell or range, press and hold the CTRL key while selecting other cells or ranges. 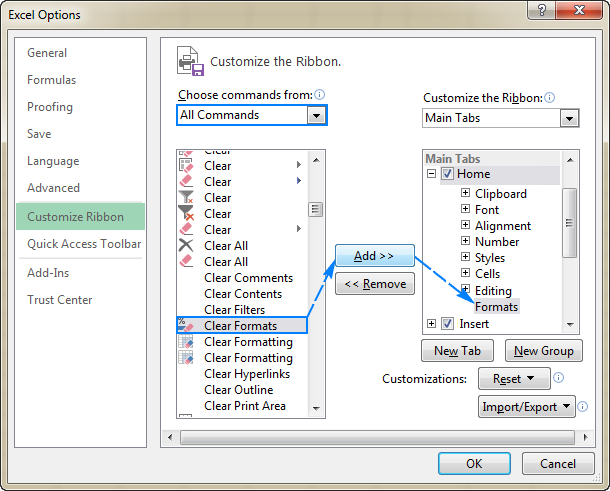 If you want to have a one-click tool to remove formatting in Excel, you can add the Clear Formats option to the Quick Access toolbar or Excel ribbon. This might be especially useful if you receive many Excel files from your colleagues or clients and their formatting prevents you from making the data look the way you want. 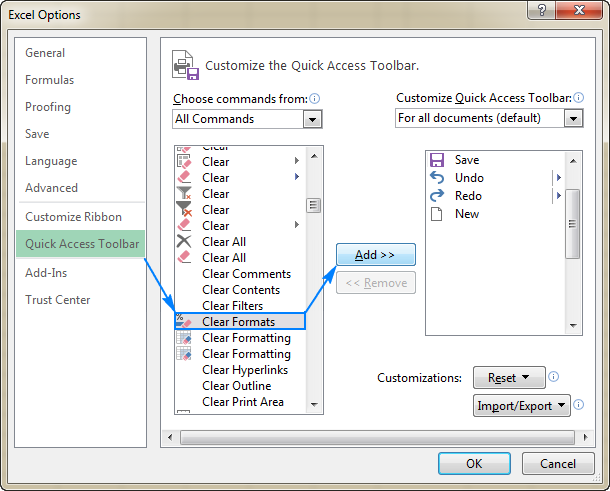 In your Excel worksheet, click File > Options, and then select Quick Access Toolbar on the left-side pane. In the list of commands, scroll down to Clear Formats, select it and click the Add button to move it to the right-hand section. If you'd rather not clutter your Quick Access toolbar with too many buttons, you can create a custom group on the Excel ribbon and place the Clear Formats button there. With the New Group selected, click the Rename button, type the name you want, and click OK. In the list of commands, scroll down to Clear Formats, and select it. Select the newly created group and click Add. Finally, click OK to close the Excel Options dialog and apply the changes you've just made. And now, with the new button in place, you can remove formatting in Excel in a single click! Select any unformatted cell close to the cell from which you want to remove formatting. Click on the Format Painter button on the Home tab, in the Clipboard group. Select the cell(s) from which you want the formatting cleared. Sometimes, when creating a sophisticated worksheet design, you might apply various formatting to certain cells, and at a later point you may want to remove some but not all of the cell formats. Remove excessive formats manually one by one. Either way is cumbersome and frustrating… unless you have the Cell Cleaner add-in installed in your Excel. On the Clear Formatting pane, uncheck the boxes for the formats you want to retain. By default, all of the checkboxes are selected including number format, alignment, font, background color, text color, conditional formatting, and borders. I hope you liked this quick and straightforward way to remove formatting in Excel. If you want to give it a try, you are welcome to download the 15-day evaluation version. 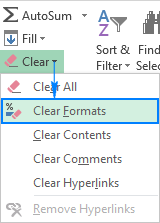 4 Responses to "How to clear formatting in Excel - remove all or only specific formats"
Svetlana, I just recently came across your blog postings. I frequently come across situations where I know Excel can do something I need, but am just not sure which formula to use or how to make it work. I use google to find the answer from various sites, but the information can be difficult to follow, buried in a conversation, incomplete, etc. Your blog postings are excellent, well put together, simple language, thorough, easy to follow. This is fantastic. You should put these into a book. Having an issue with Clean Cell Add In. Running Excel 2016 and Ultimate Suite with this plug-in. 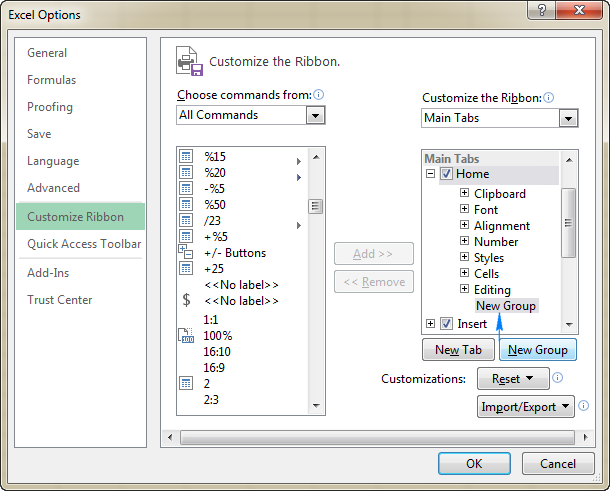 The add-ins are enabled, but this feature does not appear in the ribbon. Sent an e-mail with all the specifics of OS Ver etc. No reply yet and need this function for something I have to complete today. Any help is greatly appreciated.